The latest and greatest hotels, resorts and unique stays to check into and check out right now. Kāmana Lakehouse is the latest addition to Queenstown’s hotel offering. Located high above Wakatipu Lake, the boutique property’s 73 rooms feature contemporary design (inspired by the Kāmana bird and its natural habitat) and luxe amenities, while the Living Space provides guests with a convivial social space complete with fireplaces and floor-to-ceiling windows with views to the lake and the surrounding mountains. With bright jolts of colour that pop against the endless blue of sky and sea, LUX* North Male Atoll in the Maldives sets itself apart from other properties in this paradise. Its 67 two-storey residences sit on the beach or over water, each boasting a rooftop area, private pool and butler-style host. 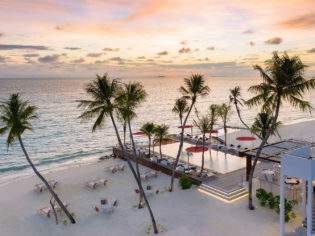 There are numerous restaurants, one overseen by the Maldives’ only Peruvian chef, Beach Rouge with its pool-club vibe, and an over-lagoon wellness spa. Reflecting Phuket’s unique history and culture through its decor and guest experiences, the 180 spacious and vibrant rooms of Hotel Indigo mimic the area’s tropical location and buzzy nightlife. There’s also a 24-hour fitness centre, authentic local dining experiences and a Muay Thai boxing ring with professional trainer on site. In the Indian city of Bengaluru (formerly Bangalore), Four Seasons has installed the 230-room Four Seasons Hotel Bengaluru and Four Seasons Private Residences into the hospitality, retail and corporate Embassy ONE development. Conveniently located 30 minutes from the airport and well connected to the CBD, the sleek hotel features a selection of dining options, a pool, lush botanic gardens and spa. Located in Japan’s unique tropical paradise, the luxurious rooms of this boutique property all have balconies overlooking white-sand beaches, with several boasting private pools. Plus the spa incorporates local Okinawan ingredients. Luxury safari and experiential travel company andBeyond has recently opened the brand new Tengile River Lodge, a luxurious lodge in South Africa’s Sabi Sand Game Reserve, and boy is it magical. The nine-suite lodge offers a high level of exclusivity and sense of tranquillity with a contemporary bush design. Each of the suites features a private deck with a swimming pool, an outdoor lounge and a master bedroom that opens out onto a luxurious bathroom with an outdoor shower and views over the river. Built with an extremely light footprint, using sustainable construction materials and an environmentally friendly design, the lodge has also been cleverly positioned on a bend of the Sand River, so that each suite is nestled in the tree line along the riverfront and boasts a magnificent view out over the Sand River, an area inhabited by a world-renowned diversity of wildlife. The elegant design concept is based around blending luxury with the natural landscape and bringing the outdoors inside, drawing inspiration from the textures of the surrounding bush. This new five-star resort is located 10 minutes away by car from Luang Prabang’s UNESCO World Heritage-listed old town. Its 16 hectares encompass 123 modern guest rooms with large terraces, a two-bedroom villa and a healthy scattering of infinity pools and streams. The Pullman Luang Prabang is now the largest hotel in town, but its low-rise architecture – which draws on traditional Laotian influences – sees it blend in well with the surrounding natural landscape. Guests can dine on international cuisine at L’Atelier and sink a cocktail overlooking paddy fields at the Junction. Promising a real once-in-a-lifetime experience, One&Only Nyungwe House sits within the dense Green Expanse of a tea plantation, next to Ancient Montane rainforest. Wild experiences such as chimpanzee Trekking or walking among majestic mahogany trees allow guests to max out the incredible setting. The 23 rooms and suites combine local African craftsmanship with a contemporary look and feel, Plus there’s a Spa that uses natural products from luxury brand Africology. Located in the historic university town of Göttingen, in Germany’s Lower Saxony, Hotel Freigeist is a relentlessly modern new build (and a member of Design Hotels) featuring 118 rooms. The décor continues the theme, with wood and copper fittings throughout contrasted against a palette of grey bricks, neutrals and shots of blue, and Basquiat-inspired artwork. The whole thing has a Nordic vibe (enhanced by the on-site sauna), but in Intuu, its signature restaurant, it’s Japanese/South AmericaN Fusion all the way. Omaanda is nestled in the Namibian savannah in the heart of the Zannier private animal reserve. Its 9000-hectare footprint, which offers lashings of peace and quiet and natural beauty, houses 10 luxury huts inspired by traditional Owambo architecture. Ambo Delights restaurant offers cuisine inspired by the best local produce, while the bar at the edge of the heated swimming pool has views over the savannah. A perfect blend of old and new Shanghai, the 145-room Shanghai EDITION sees Nanjing Road’s 1929 Art Deco Shanghai Power Company building fused with a new-build skyscraper. Its various food and drink options include star chef Jason Atherton’s HIYA (translated to ‘clouds in the sky’), a Japanese izakaya-inspired eatery on the 27th floor. The Six Senses group has had a busy year, having already opened properties in Singapore and Fiji; now comes Six Senses Maxwell. A sister property to Six Senses Duxton, the wellness brand’s first city hotel, the 120-room property is also retrofitted into a historic Singapore colonial-style building and features Euro-chic interiors courtesy of French architect and designer Jacques Garcia. The first Kempinski hotel to open in Bali is a suitably grand reflection of Balinese architecture and craftsmanship. Situated in the Nusa Dua area of the island, the hotel boasts 475 rooms, suites and villas and all the requisite inclusions expected from the luxury brand, from five dining options to a 60-metre swimming pool to an ocean-facing spa and a cigar and shisha lounge. It even has its own beachfront wedding chapels.